Big History is a new field that has been developing rapidly around the world. What is Big History? According to its professional definition: Big History seeks to understand the integrated history of the Cosmos, Earth, Life and Humanity by using the best empirical evidence and scholarly methods. Big History deals with the universes grand narrative of 13.8 billion years and provides a connection between our past, present and future. It encompasses all forms of existence and all time scales. The present collection is divided into three volumes and is the first international and comprehensive anthology of Big History. 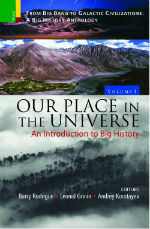 In volume one Our Place in the Universe: An Introduction to Big History our existence is regarded from different points of view: as a history of the universe, as a philosophy, and as a factor in the life of people. This edition will challenge and excite your vision of your own life and the new discoveries going on around us. Together with the authors, who come from all the inhabited continents of our planet, readers will engage in a fascinating trip into the depths of time and space, and we hope they will join us in coming to an understanding of our origins and our future.